The Tampa Bay Lightning are presently on a quick two-game jaunt to the shores of Lake Erie where they finish up a back-to-back road trip against the Buffalo Sabres tonight. The Bolts, owners of the best record in the NHL, found themselves in an early hole last night at Toronto against the Maple Leafs and eventually fell 4-3. Toronto took a 3-0 lead on a goal in the first period and two in the second before the Lightning finally broke through with less than five minutes in the stanza. Two quick Tampa goals in the first 1:18 of the third period tied the game at 3-3 but Toronto countered with a James van Riemsdyk goal just a few minutes later to finish the scoring. Tampa and Toronto are two of the faster teams in the league with a lot of skill flying up and down the ice. All-Star Lightning defenseman Victory Hedman, stated the obvious to the gathered media last night when he said that Toronto's "got some good speed under their feet and can score goals," yet he was also quick to point out, "other than that, I thought we controlled the pace of the game. We created a lot of chances and it could have gone either way." Division foes Tampa and Toronto are Nos.1 and 3, respectively, in the Eastern Conference while the Boston Bruins, also of the Atlantic Division, come in at No.2. Their places on the podium in the conference isn't all that surprising when you consider that the teams behind them in the division aren't of their caliber. Tampa, Boston and Toronto have feasted on Atlantic Division foes to the tune of a combined 29-11-4 record and have done the same in the Eastern Conference going a combined 59-24-12. Tampa's foe tonight is the Buffalo Sabres, currently last in the Eastern Conference and second-last in the entire NHL. The Sabres have been left in the NHL dust this year and have been trying to make the climb towards respectability after starting the season on a 0-5-1 losing streak and going 10-20-8 through the 2017 portion of the season. Although Buffalo had put together a solid 5-4-1 record over their last 10 games, which includes a season-long three game winning streak just prior to the All-Star break, having franchise center Jack Eichel go down to a high ankle sprain on Saturday in Boston was a huge blow to their progress. The Sabres finished out that game against the Bruins by holding on for a 4-3 win but headed back to Buffalo for the second of a back-to-back against the visiting Colorado Avalanche. The 'Lanche are a young, quick team and even without leading scorer Nathan MacKinnon were able to take a 5-2 lead in the third period then hold on for the 5-4 win. Despite some atrocious play, being able to come back should have left the Sabres with a bit of confidence moving forward but not having their star player really hurts. 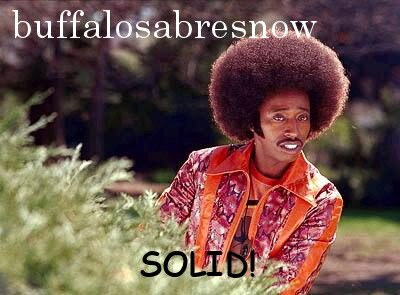 The speed element Eichel added to this Buffalo team is unmatched and his absence from the Sabres first powerplay unit was sorely missed. Plus 5v5 he's the only player on the team right now that makes his linemates better. The Colorado game was a perfect example of how much he was missed as the Sabres were outskated, didn't score a goal 5v5 and although they did score a goal on the powerplay, it was with a two-man advantage. The other four powerplay opportunities came 5-on-4 and they could barely establish an offensive-zone presence. The Sabres will have a morning skate today which marks the first time they'll be on the ice in a non-game situation without Eichel. No doubt they'll be working on the powerplay as they're going to need as many goals as they can, but head coach Phil Housley may want to keep an close eye on his defense. For two of the last three games (both wins) the pairing of Rasmus Ristolanen and Nathan Beaulieu was solid. However, they were a disaster against the Avalanche on Sunday night. It began only :43 seconds in when Colorado's Colin Wilson somehow got behind the duo, pulled in a 130' pass and fed a streaking Alex Kerfoot for a layup on a 2-on-0. It was all downhill from there for that duo, especially for Ristolainen. The 23 yr. old workhorse d-man for Buffalo was on the ice for all five Avalanche goals and was pinned to the bench 5v5 for nearly all of the second and third periods. Something clearly wasn't right for Ristolainen as he may have had the worst game of his career. Fatigue, both physical and mental, may have played a role, or as Housley put it post-game on Sunday, "preparation, maybe confidence" might be some of the issues. Ristolainen hadn't played less than 27 minutes in the six games post All-Star break yet Housley kept loading up the minutes. After the Colorado game, "I just don't see him as sharp in his game right now, going back to the All-Star break and I think he's got to refocus and get his game back." Add it all up and this game vs. the Lightning without Eichel isn't exactly the best scenario for the Sabres. But then again, games are played on the ice. Housley mixed things up on the forward lines moving Benoit Pouliot from the fourth line and Sam Reinhart from the second line up to the first line with Ryan O'Reilly. Forward Evan Rodrigues starts at center again on the second line with Evander Kane and Kyle Okposo on his wings while Scott Wilson drops to the third line with center Johan Larsson and Jason Pominville, who was on the first line against Colorado. Jacob Josefson anchors the fourth line with Zemgus Girgensons and Nicolas Baptiste. Baptiste finally makes it into the lineup after getting the call on Sunday but sitting out the Colorado game. The 22 yr. old should add much more speed and a better scoring touch than the player he replaced, Jordan Nolan. Housley is sticking with the same d-pairings he's used the last three games with rookie Casey Nelson up top in a pairing with Marco Scandella. Nelson has been playing very well, despite a few rookie mistakes, while displaying speed and crafty stickwork. He also scored his first NHL goal which happened to be a shorthanded tally. 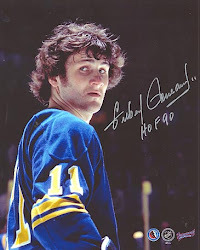 Only one other player in Sabres history had done that and you have to go back to March 14, 1971, according to Sabres PR, when Kevin O’Shea scored his first NHL goal shorthanded at Minnesota against the North Stars. The duo of Ristolainen and Beaulieu are back for a fourth straight game with Justin Falk and Victor Antipin once again on the third pair for the third straight game. Defenseman Josh Gorges looks to be in the press box keeping Nolan company. Word from the rink also has backup goalie Chad Johnson in net.